Small Change in Africa, making a big difference. My relationship with Africa has probably mirrored that of many others – especially anyone who like Madonna and me, went through the Catholic school system in the sixties. We were introduced early to Africa by the nuns at school who, in that politically less-correct time told us about the affectionately named ‘Black Babies’. We were encouraged to bring in our pennies each week so that when we had donated a total of half a crown I think it was, we were eligible to stand in line before the teacher’s desk, waiting to disclose the name we had chosen. This name was duly written on the back of a little card which bore a photo of a cute ‘adopted’ black baby. Well, at least, it was explained to us that this particular baby was not necessarily the exact one, but one pretty much the same. And that was fine by us. We were only about 7 or 8 years old ourselves at the time and didn’t take our ‘parental’ responsibilities too seriously. And so the relationship began for me, with on the one hand, images of cute, dependent, black Africans, and on the other, heroic compassionate courageous and bountiful white missionaries supported by our collections. It seems outrageous now, but it was a simpler, more innocent time and we knew a lot less about mysterious Africa. As a student I remember joining the Third World First society in Freshers’ Week, although I don’t ever remember attending a meeting after that. When I left university and married, and started to have a little bit more money, we decided to sponsor a child in Africa. Our child lived in Burundi and we set up a direct debit of a paltry sum to be paid each month towards his up-keep. I think I wrote to him once and got a reply from an Aid worker reporting on his progress. It was enough to sop the conscience, and we had some idea that one day we might even go to Burundi to meet him. But we had our own four children and all the demands that normal family life entails, and we bedded down into doing our best for our own. We had come a long way from seeing Africa as just ‘poor and deserving’, now Africa was disturbing and demanding our attention. I remember the famine in Somalia in 1992 and seeing Irish President Mary Robinson’s face wracked with anguish as she held the dying babies there during her visit; the horrors in Rwanda in 1994, and the feelings of helplessness and indignation about what was happening there as we in the West looked on; trying to understand the sheer numbers involved in the AIDS epidemic sweeping the continent in the nineties. So, again, we gave money to charities like Concern and Trocaire, and we probably felt that was all we could do, and settled down to our busy lives. But Africa had become a constant, rather demanding, partner in the relationship, which was now more real, but conducted mainly through images on the television – and so, was easy to turn off. It was through Fr John Ryan, a St Patrick’s Missionary priest originally from Tipperary, but who had spent 25 years in Malawi, that my family and I got the opportunity to meet a part of Africa at first hand. John is a priest and a mathematician. The mathematician part of him wanted to do a PhD and his area of interest coincided with my husband Patrick’s expertise, so John became his student. They worked together via email, and whenever John was home in Ireland on leave. Gradually, John started coming to the house to have a meal with the family when he was in Cork. When he wasn’t talking coding theory with Pat, all he wanted to talk about was Malawi – the “warm heart of Africa”. He showed us photos and spoke about its beauty and about the people of his parish and of the University of Mzuzu where he lectures in mathematics. “You should come and visit”, he would say, and we thought, ‘Yes, one day we will’. Then, a year after he was conferred with his doctorate, an email came from John inviting Patrick to give a month’s course to the first mathematics post-graduate students of Mzuzu University. The University couldn’t pay him but they would provide accommodation on the campus. We decided that we would both go and that I would do voluntary work in the community. John told us there would be plenty. We began to talk about what it would be like to finally be there, and it didn’t take too long for each of our four children to decide that this was an experience not to be missed for them either. They were all at stages of life or study that meant they were free to give their time. We felt proud of them and John was very enthusiastic. 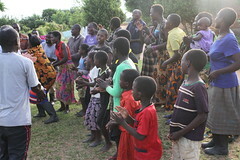 He told us it would mean a lot that our entire family had decided to come, as in Malawi, family is extremely important. So we booked the flights months in advance, and got on with our lives. Every so often I would wonder if we were being very irresponsible. What if one of the kids got bilharzia – a nasty infection that is quite common along the shore of Lake Malawi? What about snakes, my personal phobia? What if it was just too hard to see the poverty and illness and suffering that John had described to us? The sense of responsibility in encouraging and bringing our four young adults along to something that was almost a complete unknown to us was daunting. When we had asked John what we could bring out with us, he said “The need is so great. Just bring money”. We asked our friends and family to contribute one hour of one day’s pay to Malawi. The response was wonderful, and we left Ireland with almost €12,000 lodged to an account in Mzuzu to be administered and distributed by St Augustine’s parish committee of which John was a member, and on projects that we would be involved with. We were in Malawi for almost two months. We spent six weeks working in Mzuzu – Patrick in the University, and the children and myself with three projects under the auspices of St Augustine’s. The people we worked with and for, however, were of every denomination, not just Catholic. We visited villages and out-stations miles down red, rutted, dusty tracks, with members of the Msiki Home Based Care group – ordinary villagers who have nothing themselves but who care for those who have even less, those who are suffering illness, who are disabled, or alone. 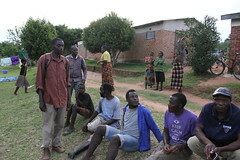 We met with the Dunduzu AIDS Support Group, a fantastic group of men and women, young and old, all HIV positive, who have got together to encourage one another and to take their message about AIDS prevention to people in the out-lying villages and communities. John had asked us to work with these two groups to put together a grant proposal for each of them, which would be presented to the National AIDS Council applying for financial support. 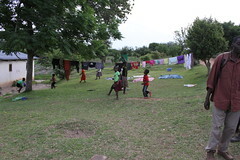 We were able to do this with his help and after many visits to establish needs, and many meetings with the committees, sitting on low wooden stools in front of mud and grass huts or corrugated iron clad brick buildings of local clay. We were invariably greeted with smiles, and shown warmth and hospitality by all those we visited. They had nothing themselves and were embarrassed not to be able to offer us something to eat. They had one set of clothes, often second-hand clothes from the West, which we discovered many of them believed came from people who had died. They couldn’t imagine anyone, even in the West, having a second set of clothes that they could just give away. The people we met were amazing. At the Area 1B ‘orphanage’, for example, two young teachers, Margaret and Love, who had never been paid because there were no funds, have spent the last three years working with 2 to 5 year olds in the area whose parents have died of AIDS. They work in the shell of an unfinished house, with no doors or windows and bare earth on the floors. The house is on loan to the committee set up to administer the project in St Augustine’s. A cook and some other helpers serve nsima, a type of maize porridge, when there is money to buy the grain, and Margaret and Love teach the children English through rhymes and songs. It has already been found that these children, so disadvantaged in life, have at least some advantage when they begin formal school at the age of 5. Our daughters, Áine and Maeve, really enjoyed working there, and fell in love with the children. Mark and Ciarán, our sons taught a (very!) mixed group of 16 to 50 year olds English and Drama in the parish hall during the weekday evenings. Like Áine and Maeve, they had been anxious about what if anything they could offer, but the farewell party we had convinced them that they had indeed been able to provide something, and that they had been given an enormous amount in return. It was wonderful for me to see our own children so shy at first about what they could do, but responding to John’s and our encouragement, and really throwing themselves into caring for the children, going out to the villages and meeting the elderly, sick, desperate, writing grant proposals, and sending beautiful emails back home to somehow try to process their own reactions. We were proud of the way they naturally showed respect and genuine care and admiration for the people we met, the helpers as well as the ones needing support. 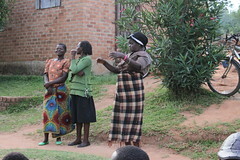 They learned so much too in terms of wisdom, community, care and laughter. When we left Mzuzu, all the groups we had worked with asked us the same thing – ‘Please don’t forget us when you go home to Ireland’. We haven’t and we won’t. Being in Malawi together as a family was one of the most wonderful experiences of my life as a wife and mother. As for my relationship with Africa, well it has been ‘consummated’ by our stay there. After the initial innocent and superficial stage, was a more passionate and sometimes troubled courtship, but now it feels as though Africa and I have embarked on a long and deep relationship. I have taken only one vow – not to forget, and like the marriage vow to love, it seems easy at this stage. Johanna Fitzpatrick and her family have set up the “Small Change” Project, to continue their support for the people of Mzuzu. If you would like to contribute to the fund, donations can be sent to The Mzuzu Account No 42780121 at the Bank of Ireland, 70 Patrick St, Cork City, Ireland, sort code 902813. They have produced a 2007 Calendar, with photos from their time in Malawi, to raise funds for a new orphanage building in Mzuzu. To buy a calendar, or learn how else you can support the project, email corkfitz@esatclear.ie. Just when you think you are winning, there is a nasty around the corner. Harisen´s report today is very different. Thunderstorms hit the Zambia village yesterday resulting in huge flooding. Part of our village garden was washed away, just as we were ready to go to market. the dashing of dreams is a common occurrence here. What do these amazing women say?, “We have some seeds left, we´ll plant them as soon as the floods have gone”. I´m devastatated and I´m 6000 miles away. I know how hard they all worked, because I was there with them for the cultivation. You can see their efforts by looking at the small video “Meitheal in Mzgora”. I´ts hard to imagine that in a very short time there will be no water to be found ant this soaked land will turn to dust. BUT there are solutions!. The close contact with these village people makes the problems of Africa very real to me. Lessons will be learned and we will avoid planting in these areas during the rainy season in future or maybe build dykes or widen the stream. New seeds will arrive tomorrow if the roads permit and the spirit of these remote women will be tested one more time. Harisen Amin tells me that ther first village garden is ready for first harvest. They will bring the first maize to market next week, 96 days after it was planted. They are frantically trying to find a bike to travel the 36 Km to market and they are arranging to open their first collective bank account, having decided this option just last week. I would love to be there with them, to see the first fruits of their labours, but knowing they are finally doing it is wonderful. Hopefully, this is a small but significant beginning of a whole new era for them. Organsise by longterm friend Tony Tobin and ably assisted by John Mills and his wife Margaret, the quiz was a wonderful financial success as well as a very enjoyable night.The effort raised €1215, from the generosity of all those gathered. Sean Walshe, the quizmaster was at his very best, the Clandillons got through an amazing amount of work, the spot prizes were numerous and of a very high standard and the Clubhouse was very welcoming. On behalf of the eventual village recipients I offer sincere thanks to all. This fund will enable us to give the village the jump start needed for self suffiency in terms of food security and clean drinking water. What an amazing thought, seeing that we all had such a wonderfully enjoyable night. I would also like to thank the local representatives, Frances Fitzgearld, Billy Gogarty, Paul Gogarty Derek Keating, Eamonn Tuffy and Joanna Tuffy. (alpahbetical order). Their support and donations are greatly appreciated. On a sad note, Tony and Margaret are leaving us to head South East and in that we wish them health and happiness in their new home. We had a spot on the Wide Angle show this morning. A bit daunting, but educational. I would prefer the remoteness of M’Bama village. As a result of John Waters’ article in the Irish Times on Jan 8, 2007 we got a wonderful calendar, letter and copy of an article in the Examiner, in Yesterday’s post. 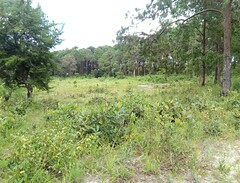 It came from Joanna Fitzpatrick, who with her husband Patrick and family Aine, Maeve, Mark and Ciaran, had visited and worked in Mzuzu, in 2005. I was so excited that I rang her even before I read anything. They are (extra)ordinary people who have done their shift in Malawi and are now supporting what they started. Wells for Zoë is a small Irish humanitarian organisation. We are focused on bringing clean water to the rural poor in Northern Malawi. Set up in 2005, Wells for Zoë concentrates on low cost, small scale, appropriate and sustainable water technology. e-mail, for further details and please sign the GUESTBOOK. Please DONATE to Wells for Zoë - Water for Life. Restoring Hope, Unlocking Potential... from The Water Project on Vimeo.